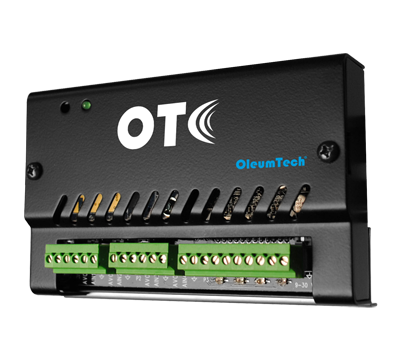 The OleumTech® Wireless Multi-I/O Module provides a quick and scalable solution for adding analog inputs and digital I/O points to any OTC Sensor and I/O Network. The Multi-I/O Module is equipped with four high resolution analog inputs (24-bit ADC). Each input can be independently selected for either 0-10 Vdc or 4-20 mA mode of operation. It also packs four independently configurable digital channels. Each channel can be setup as an input, counter, output, or pulsed output. The Wireless Multi-I/O Module also features Modbus master functionality, which gives users read and write controls over assets connected over its RS485 Serial port. With the provided robust RF range, the Wireless Multi-I/O Module can rescue stranded I/O points that was once economically not feasible. The Multi-I/O Module can be added to the network as needed and its I/O points can to be mapped to anywhere within the OTC Network creating an efficient, highly advanced system that is yet easy to create and manage. The Wireless Multi-I/O Module communicates with an assigned wireless gateway in the OTC Network. This wireless device is certified for use in Class I, Division 2 (Zone 2) hazardous locations.